Sculptured Relief and Bronze Finishing. A medal of “LYON”, our home town, created as a gift souvenir. The sculpture shows miniature images of local specialties: gastronomy, photography, textile, the “Guignol” puppet theatre, key monuments, etc. Sculptured Relief and Antique Silver Plating. 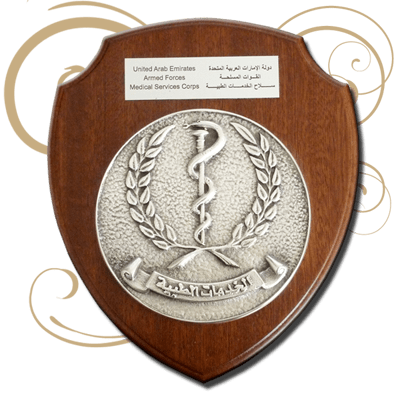 A trophy made in bronze casting fixed on a wooden shield with a personalized plate which was awarded for long standing service employees. Real hard enamel colours (vitrified at 850°C / 1562°F). An insignia designed to celebrate the 100th anniversary of the mountain rescue force in Slovenia. A gift created for the inauguration of a luxury hotel in Shanghai. The stamped medal on its lid shows the new buildings of this hotel. Attachments: Ball & Ring / Ribbon. An insignia which has been distributed among the members of a political party to reinforce the sense of membership and promote their shared values. Antique Silver Plating and Soft Enamel Colors. 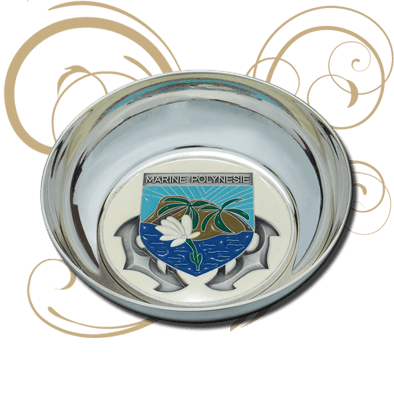 A stamped custom medal, presented in the bottom of a silver plated bowl that we call "coupelle". These "coupelles" have been created for a Marine Corps which offers them to official visitors and relatives. Real hard enamel colors (vitrified at 850°C / 1562°F). 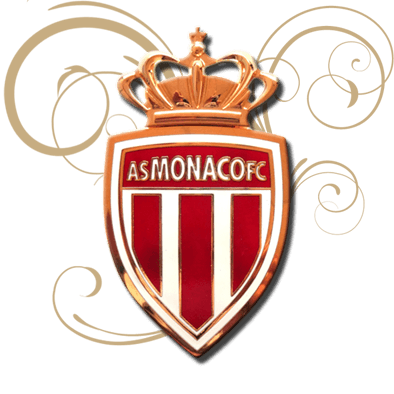 A golden car emblem offered by a successful soccer team to be fixed on a car grille. F.I.A. stands for Factory of Artistic Insignias, “Fabrique d’Insignes Artistiques” in French. 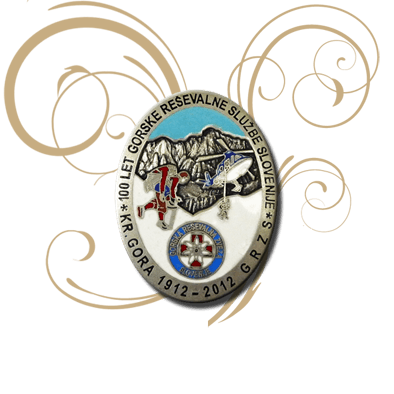 Our company was created in 1928 by a French jeweller near Lyon, in the south-east of France. We have inherited the traditional skills of stamping precious metals. 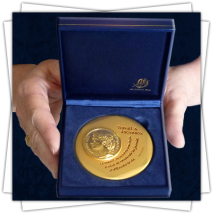 Since 1928, we have been creating and manufacturing custom medals and bronze awards for many organizations all over the world. 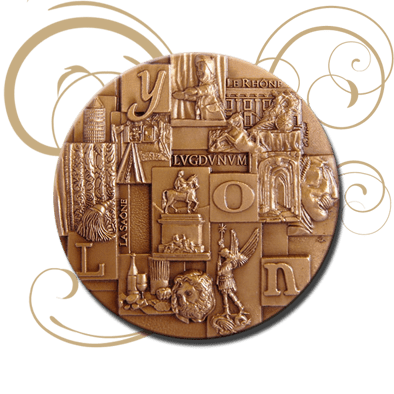 Our clients range from large, prestigious organizations to small groups, each with the same goal: a personalised medal to serve as a strong artistic symbol of their values. 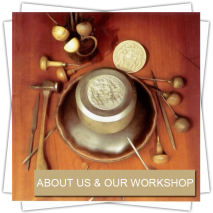 Learn more about us and our workshop. 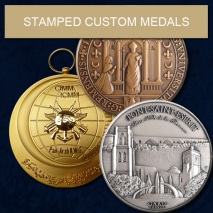 STAMPED CUSTOM MEDALS Our core specialty: with a diameter between 5 and 9 cm (2″ and 3.5″), these medals are stamped in brass or precious metals. BRONZE CASTING MEDALS & TROPHIES The bronze casting medals are bigger (from 8 cm to 1metre / from 3.1″ to 39.4″), heavier and crafted by hand. 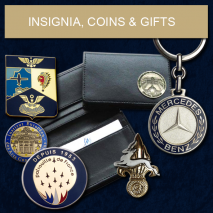 INSIGNIA, COINS & CUSTOMIZED GIFTS The insignia, coins and small medals are smaller (under 50 mm / 2″), and are made using a variety of processes and materials. 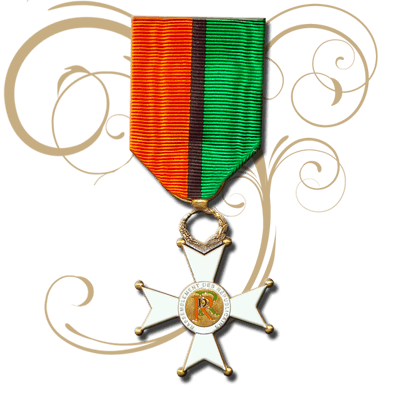 Why Offer a Custom Artistic Medal? Reinforcing the community spirit and shared values within companies, associations , army corps, government agencies, etc. -why not create a customized medal ? 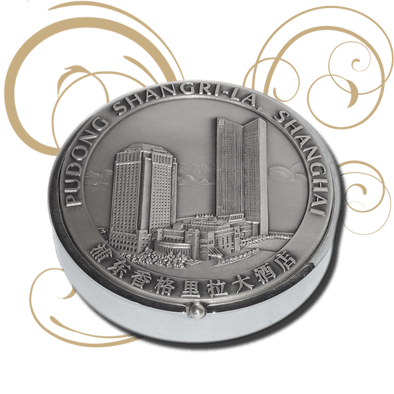 The bronze medals are cherished by their recipients as a token for a specific achievement, and are appreciated especially for their inspired artwork, the precision of the tool engraving, the quality of the material and the know-how displayed in the stamping and finishing work. If you believe that creating a beautiful personalised medal will serve as a timeless symbol or a touch of eternity, then let us help you in that task. In the process of creating your custom medal, we will work with you to create the artwork which will convey your message or your identity, making the best use of the medal maker’s know-how while staying within your budget. We will suggest and discuss with you specifics such as size, shape, material, type of relief, metal finishing, touches of colour, polishing, specific attachments for your medal. Then we help you create the most appropriate presentation for your medal depending upon the expectations of your recipients, the number distributed and your budget. 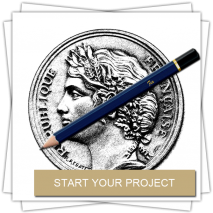 Learn more about how to start your project. A minimum manufacturing time of 6 to 8 weeks is necessary to create and manufacture the personalised medal, once the artwork has been finalized. A minimum order of 30 pieces for stamped bronze medals and 50 pieces for insignias and coins is required to justify the creation of a custom tool and the launch of a manufacturing batch. 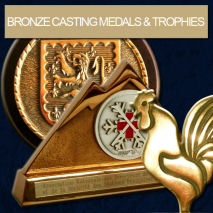 Because they are handcrafted, the bronze casting medals can be ordered in smaller quantities.